On days with good snow, the Westford Academy nordic ski team practices at Great Brook Ski Center in Carlisle. The warm February weather is a pleasant opportunity to enjoy the outdoors without the bulky winter coat. 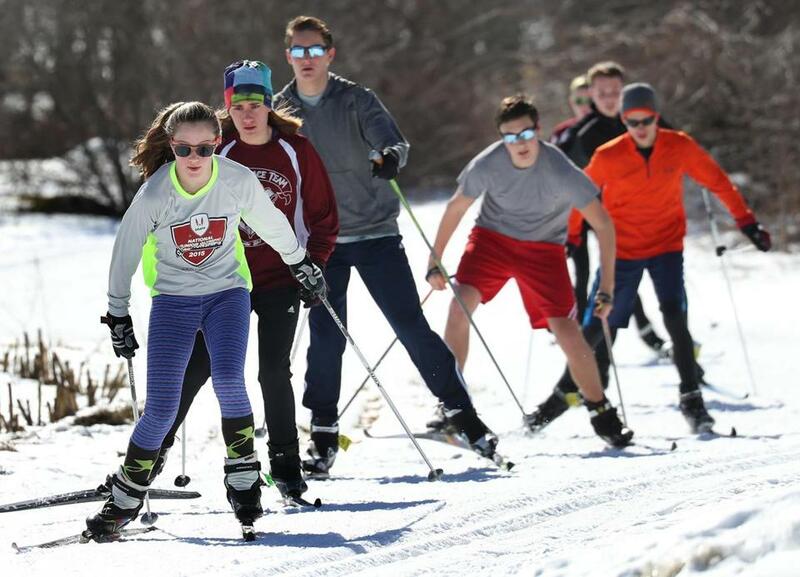 For the Westford Academy Nordic ski team, the unusual winter warmth brings with it a unique challenge. For most of its practices, the team has a 30-plus mile trip to the Weston Ski Track, which when bare operates as the Leo J. Martin Memorial Golf Course. 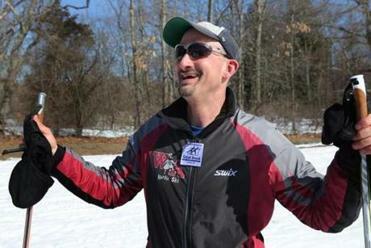 It’s the closest cross-country facility to Westford that makes its own snow. Most weekdays, when the team isn’t out on the snow, the Grey Ghosts have dry land practices on the public school campus. Workouts include balance training, long-distance runs, and roller-skiing. Still, the only way to effectively practice technique is to actually get outside, and in comparison to the other teams in the Mass. Bay West League — which holds its meets in Weston — the Grey Ghosts have significantly fewer hours on the trails. Westford coach Andy Norander laments the long rides to and from Weston. When the snow is plentiful, the Grey Ghosts travel just 7 miles southeast to the Great Brook Ski Center in Carlisle, which has over 15 miles of groomed trails. Norander would love to have his team practicing there more often, but said the snow hasn’t been consistent enough in the last decade or so. When the skiers makes the trip to Weston, it’s not uncommon they’re on the bus longer than they’re out on the trail. Typically every other Saturday, the team will make a trip to the White Mountains in search of snow in places such as Waterville Valley, Jackson, and Mount Monadnock. But despite their geographical challenge, Westford Academy perennially finishes in the top half of the Mass. Bay West League and for the last five years, both the boys’ and girls’ programs have finished in the top 10 at the state team championships. “We’re competing against kids who have been skiing a lot longer than us and are on skis twice as many days as we are,” Norander said. “I’m extremely proud of how our kids have competed over the years. 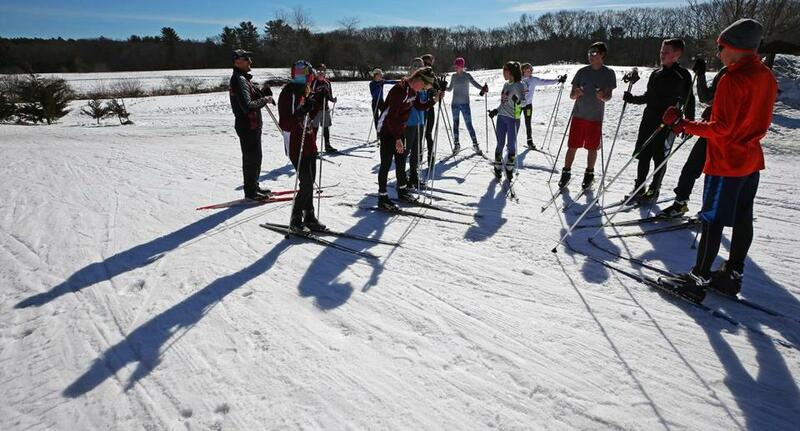 Westford Academy nordic skiers take a break after a run through the trails in Carlisle. P.J. Wright can be reached at pj.wright@globe.com.